The Wood Blewit or Blue stalk mushroom is very attractive due to it's purple or lilac colour. 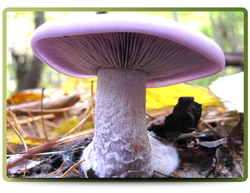 It is an edible mushroom found in woodlands and is sometimes confused with certain purple Cortinarius poisonous species, however, the Wood Blewit has a distinctive odour likened to the smell of frozen orange juice. The stipe is normally quite short and stout. The spore print is white to pale pink and the poisonous Cortinarius is rusty brown.